I heard a little voice in my head tell me that maybe I should experiment with other plants in my wheelbarrow planter before I committed some of the mini hostas to it. Frequent readers of my blog may be asking, "Who's voice did you hear, Carol?" Dr. Hortenstein is the experimenter. She likes to try new things and put together new combinations to see what happens. Dr. Hortenstein is a scientist, of course, and looks for data to prove her point. Sometimes, though, what she puts together is just hideous, monstrous even, so much so that the plant combinations terrorize even the garden fairies. And they are not easily frightened. She and Gloriosa Vanderhort, my stylist, sometimes get into heated debates over something that Gloriosa thinks will look good in a particular container but Dr. Hortenstein, as a scientist, thinks it will only live about two minutes in that container. Dr. Hortenstein usually gets backing from my practical, sensible, personal assistant Miss Jane Hortaway, who doesn't want to waste plants, and more often than not gets her way. I'm working through it all with Dr. Hortfreud, my therapist, who thinks that occasionally trying Gloriosa's ideas would be good for a change. My goodness, I end up with a lot of people in my garden some evenings, loudly debating and discussing. It is a wonder anything gets done around here. When it gets too loud, I just go off and water or weed and wait for things to simmer down. Anyway, with Dr. Hortenstein whispering in my ear, I decided that I would experiment with impatiens in the wheelbarrow planter before planting mini hostas in it. This made Gloriosa happy because she has been wanting me to get an old wheelbarrow and plant it up for the longest time. Miss Jane Hortaway raised no objections because I spent less money on 18 impatiens than I have on any one mini hosta. "Chief", Jane said, "I think you've come up with a good compromise for everyone." 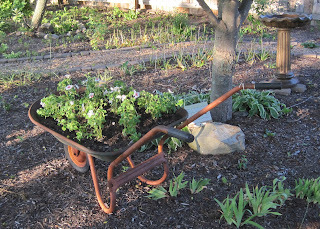 If the impatiens survive this season in this rather shallow wheelbarrow, next spring I may plant some of the mini hostas in it and park it in the shade of a tree. If they die, then I'll try something else, like maybe violas and pansies. If anything else happens, I'll call Dr. Hortfreud. Thank you for making me laugh out loud! I just found your site this past Saturday when I Googled some gardening questions. Long after my questions were answered, I was still scrolling and reading your posts and thoroughly enjoying them.Gardening and good writing--what a great combo! LOVE your wheelbarrow.... mini hostas or not. And you have me chuckling as well! Very nicely done, Carol, and how nice to have so much company out in the garden. I already like Dr. Hortenstein, saving money and trying new things. Yes to that. I think your mini hostas will survive in that wheelbarrow Carol. I have had mini hostas in a concrete planter for years. They do well in planters. That's a creative idea -- I'm sure both hosts and impatiens would be happy there, just being In the presence of you and the voices with you in the garden! And you just reminded me that I've been wanted to get a mini hosta or two -- just to kill it in our hot, drought infested state! I keep thinking I could just baby it! Brilliant! I forgot to bring an old metal Red Rider wagon with me to SC, was going to use it as a planter. 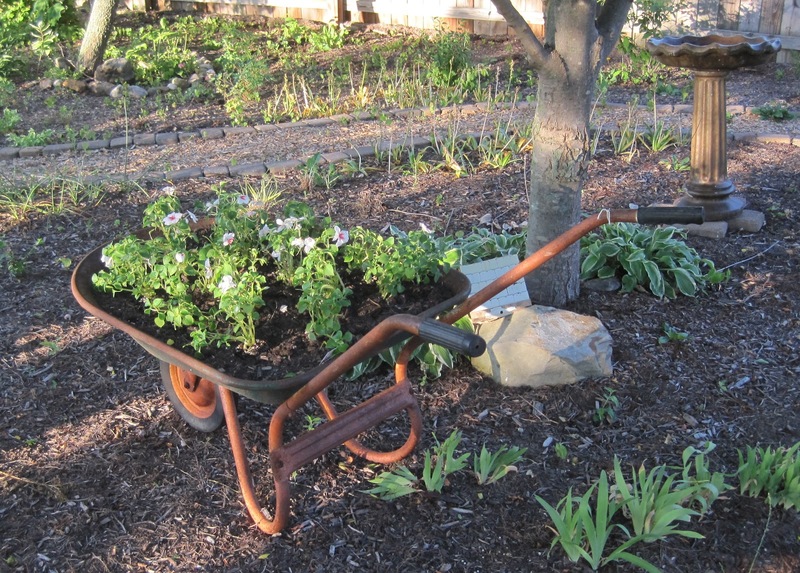 Love the barrow, the rusty red metal looks great. I have to say i share your interest in mini hostas ( and for that matter big hostas too).